Digital Libraries make Japan’s rich cultural heritage available worldwide for the first time, opening new areas for scholarship. Nonetheless, access, discovery and navigation challenges abound. 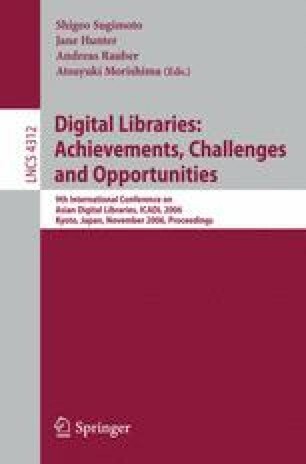 This paper presents case studies of three formats (poetry, company histories, manga) characteristic of Japanese print publishing, identifying specific support structures that are evolving to enhance scholarly access to and use of these resources in digital libraries. In particular, the role of researchers in design and construction of access resources is explored. Better awareness and understanding of the role of access resources in digital libraries has implications for information literacy programs and other kinds of instruction.